My interview tips summary: The key to feeling confident during a job interview is preparation -- one of my 20 career builders (see my 20 articles based on National Career Development Guidelines) for college students who happen to have cerebral palsy (CP). 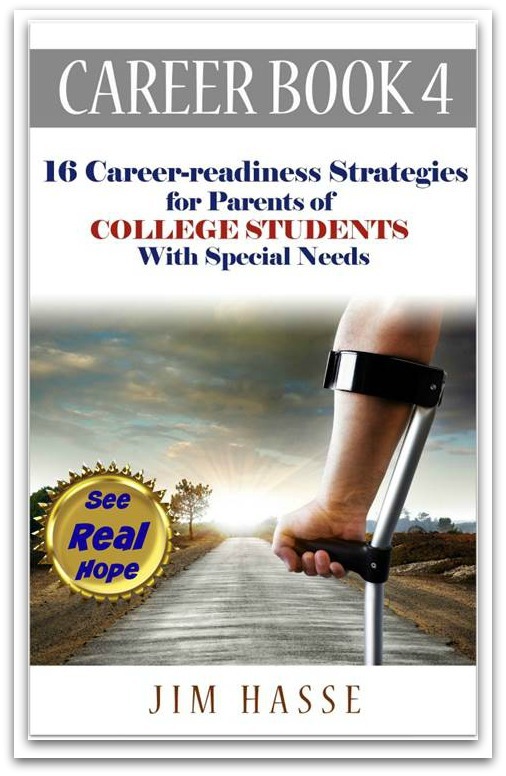 After considering the road map those guidelines outline for your college student, I believe the most essential interview tips you can give your college student with CP are these: Know yourself, know how you react to various situations and prepare yourself so you can be at the top of your performance. That’s not easy for us as mature adults let alone your youngster in college with CP who may be uneasy about how to handle upcoming job interviews. Feeling confident in any job interview situation hinges on whether job candidates have personally addressed their strengths and challenges and whether they have discovered how and where they do their best work, according to Sybil Pressprich, Senior Counselor, Adult Career & Special Student Services, University of Wisconsin-Madison. “Get feedback from others and pay attention to yourself and your reactions to various situations,” recommends Pressprich, who organizes practice interview situations and provides interview tips for her clients. And, your college student with CP also needs to prepare for a behavioral interview, which is much more probing than traditional interviewing. Under a behavioral interview, employers predetermine which skills are necessary for the open job and then ask very pointed questions to determine if the job seeker possesses those skills. For example, if successful customer care is essential for a position, then your youngster may be asked about applicable experience in customer service and personal views about how to achieve superior customer service. So, in other words, Pressprich explains, the key to your college student with CP feeling confident during the next on-campus job interview is preparation (the "first page" of her portfolio of interview tips). However, displaying confidence during a job interview is often difficult, especially if your youngster has disability issues to address. But, don’t despair if, at first, you don’t see that confidence in your youngster. Pressprich points out that 98 percent of job seekers experience self-doubt and even some symptoms of depression at some time during a job search (especially when it involves a transition from a college environment to a work setting). The good news is you can help your college student to alleviate that stress and depression and build self-confidence by collecting (and passing on) interview tips you believe to be essential to his or her success in finding a job. Focus on past experiences and personal strengths. Take classes and workshops to improve interpersonal skills. Take small steps in moving forward to reach goals. Challenge the negative thought, “I’ve had so many interviews and no job offer; what is wrong with me?” Replace it with affirmative thoughts. I found Pressprich’s suggested tactics for focusing on personal strengths particularly helpful. She recommends “The Interview Rehearsal Book: Seven Steps to Job-winning Interviews Using Acting Skills You Never Knew You Had” by Deb Gottesman and Buzz Mauro (Berkley Pub Group, 1999). As a person with CP, I spend a lot of time (much more than the average person) in the bathroom each morning getting dressed etc. I use that “extra time” to capture my affirmative thoughts about myself on a daily basis and keep them on Post It notes on my mirror. Many of them are essentially interview tips. Your youngster can do the same and review all of those affirmative notes the day before a job interview. He or she can also identify positive personal attributes by following this exercise from the interview tips I found in the Gottesman and Mauro book. Complete the sentence, “I am …,” creating a list of adjectives (which may already be in your resume) to describe yourself. Select the top five attributes you believe to be most noteworthy. Then, for each attribute, the co-authors recommend writing a specific example from your work or personal life about when you exhibited that trait. What are the three attributes which could prove to be most useful in the job for which you are interviewing? Write about how each of these three attributes would be helpful for your future employer. Also review those the day before your interview. By following these simple exercises, Pressprich says, job seekers are controlling what’s real, managing their stress levels and detailing their attributes. They’re preparing themselves to present what they want to get across to their prospective employers during those first 15 critical minutes of their job interviews. How critical are those first 15 minutes? According to the Society for Human Resource Management, 63 percent of job interviewers generally know 15 minutes into a job interview whether they’ll make a “not-to-hire” decision on a particular job candidate. So, those 15 minutes of a job interview are critical. That’s one of the most important job interview tips I can pass along to you as you career coach your college student with CP. Interviewing is a portal through which talent enters an organization, points out Florence Haley, SPHR, IPMA-HR CP, Director of Human Resources, City of Beloit, WI. Employers believe past behavior predicts future behavior, says Haley, who also spoke at the 12th Annual Summer Institute. She advises that college students tell their interviewers what they want to know in concrete terms through brief stories about their accomplishments. It's best to give details but be brief and avoid generalities. “Cite the situation you faced, the action you took and the results (some kind of measurement) you generated,” Haley urges in her remarks to college students. And, she always recommends avoiding statements such as, “This is my dream job,” “I think outside the box.” and “I’m results-oriented” -- which are generalities and have become clichés. She also cringes when she hears, “I need a job” or “I just need a break,” which I also sometimes hear from job seekers with disabilities. Employers really don’t care because those considerations are irrelevant to the interview situation, which is designed to match what the job requires with what the job applicant offers, Haley asserts. As your youngster progresses through each of these five developmental milestones, I’ll show you the barriers I personally encountered (and worked around) as a person with CP and the options you and your youngster can consider for your own “workarounds.” Many of those workarounds will likely turn out to be interview tips. In essence, each of these career builders are also interview tips because they ultimately will help your youngster develop into an individual who will stand out in job interviews and who will be a job candidate employers will want to hire. Since 1997, I’ve met many accomplished people with CP who are successfully working within a wide variety of occupations. On this site, you’ll find their success stories (and how their parents and other mentors have helped them succeed by using some of the above interview tips to coach them). Return from Interview Tips to Cerebral Palsy Career Builders.